Very few expectant mothers in Poplar were due in Episode 2, so other pressing needs in the neighborhood kept the nurse-midwives of Nonnatus House busy. 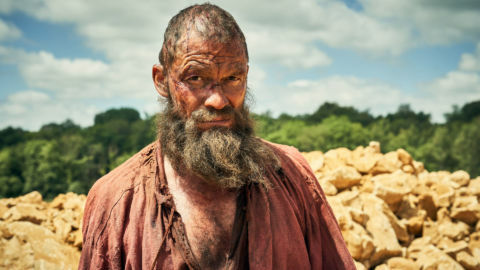 In this recap, we dig deeper into the serious health issues and history the episode touches on. When Lucille Anderson pays a house call to a new elderly client, a neighbor and girl drop hints that not all is well with Clarice Millgrove or the state of her home. When Lucille gains entry, she’s gone through the Looking Glass, but it’s not a Wonderland. We see that hoarding predates the 21 century. The shut-in Ms. Millgrove (Annette Crosbie, Calendar Girls), immobile with a festering leg ulcer, has long ago walled herself in. “Begone! 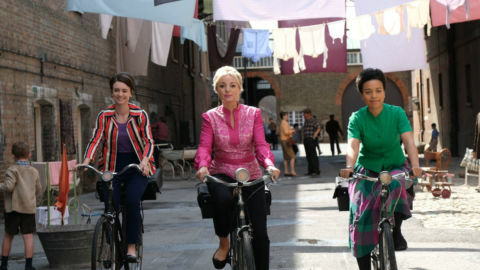 I’ll send for the police,” she angrily warns Lucille, who like all the midwives, doesn’t blink when thrown a challenge. Lucille raises Ms. Millgrove’s threat with that of a visit by Dr. Turner. Lucille wins the hand, bandages the woman’s leg and arranges for a social worker visit, and a commode. That’s a portable chair with a chamber pot to save her from the walk to the outside toilet. This is another reminder of how different life was for the urban poor in the U.K. than in the U.S.
Lucille works overtime to help grumpy Ms. Millgrove. 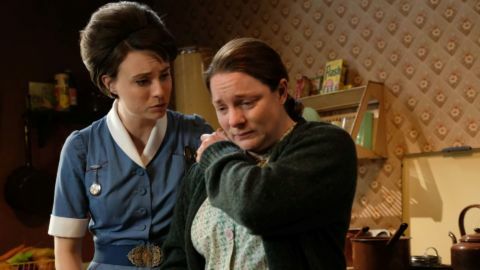 She enlists Sister Monica Joan to help tidy up the unhygienic home before social services arrives, and the older women bond over a shared love books, particularly The Illiad. 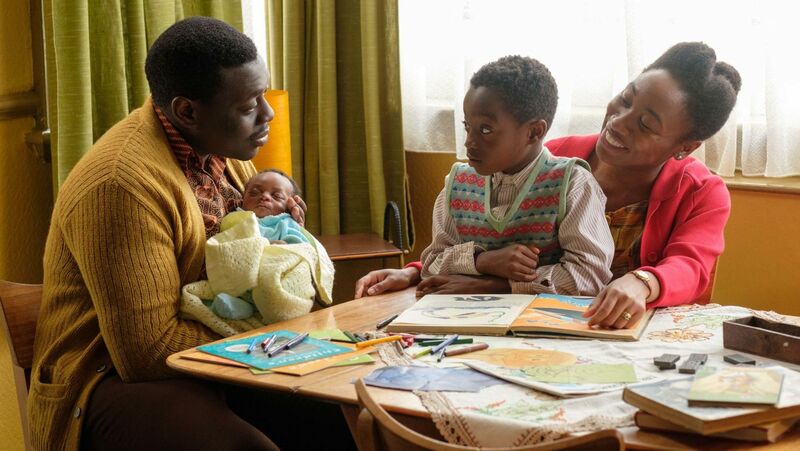 L to r: Joel Aidoo (EKOW QUARTEY), Matthew Aidoo (ZION KOFI), Flora Aidoo (JESSICA KENNEDY) in Call the Midwife Season 8, Episode 2. Sister Hilda and Trixie set off to deliver a baby in the home of the Aidoo family, immigrants from Ghana. In her excitement as lead midwife on the case, Sister Hilda is a tad bossy to Trixie, who takes it mostly in good stride. After helping deliver the anemic Mrs. Aidoo’s baby girl, Sister Hilda becomes preoccupied with demonstrating her inter-cultural sensitivity. Meanwhile, she misses what Trixie observes: the mother is in distress and bleeding heavily. Trixie takes over and their efforts stabilize Mrs. Aidoo. You can tell by Sister Hilda’s face that she wishes she were better at teamwork and focus, and she’ll resolve to do better. 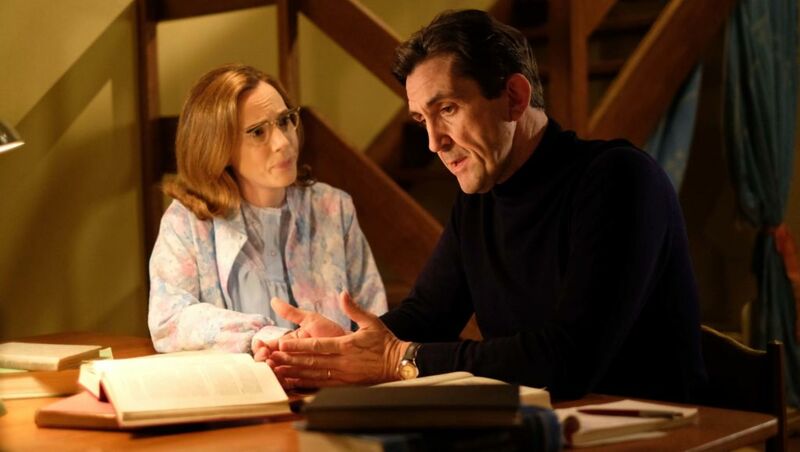 Shelagh Turner (LAURA MAIN), Dr. Turner (STEPHEN McGANN) discuss what he has learned about sickle cell. Trixie tells Dr. Turner that Mrs. Aidoo’s unusual blood loss reminds her of what she saw in Africa, where women spoke of a “curse” in some families. Dr. Turner hits the books and learns about sickle cell disease, a genetic disorder in which red blood cells form a sickle shape, with the resulting symptoms of anemia and great pain. It mostly affects people of African descent and he’s frustrated by how little information there is in British medical texts. In the 1960s, researchers still had much to learn the disease. In 1971, U.S. President Nixon made sickle cell anemia research and treatment as a priority in national health. To this day there is still no widely available cure. The U.S. Centers for Disease Control and Prevention estimates that sickle cell disease occurs in approximately 1 out of every 365 black or African American births, and in 1 out of every 16,300 Hispanic American births. Childhood and early deaths can result. (For historic context, see this timeline of milestones in sickle cell disease research and care from the National Heart, Lung, and Blood Institute). Both parents must have either the disease or be a carrier to pass it on to a child. What the Aidoo family thought was their young son’s growing pains is likely sickle cell. Mrs. Aidoo remembers an uncle with symptoms, and Mr. Aidoo admits he has kept secret his own mysterious pains. He’s also afraid of losing his job as a mail carrier. Dr. Turner urges him to find something less physically demanding. Even though Mr. Aidoo has a Master’s degree from Ghana, that – and the color of his skin – hasn’t helped him in England. He hopes he’ll be assigned a desk sorting job with the post office. Dr. Turner is able to order tests for sickle cell disease. More true to history, this was indeed the first election for Tower Hamlet, which in 1965 became a borough of 30 districts (like Poplar). Of the 60 members elected in 1964, three were Communist, and 55 were Labour party. Violet is dismayed that her husband Fred has been ignoring her campaign. When she confronts him, he testily admits he can’t stand politics: “Politicians started the Cold War!” He thinks she’d make better use of her time if she joined him as a volunteer in the ambulance corps; because he’ll be of real help when “the bomb” drops (he means the nuclear one). Violet makes a campaign stop at Nonnatus House. Her “manifesto” includes her prescient belief that many workers will be replaced by machines. She doesn’t suggest job re-training as a solution, but improved leisure services! Also on her priority list is dustbin collection, libraries, road repairs and pedestrian safety. Using the terms “fresh” and “new,” she acknowledges Poplar’s increasing immigrant population and wants to make everyone feel Poplar is home. When she asks the women if she has their support, all but Lucille raise a hand in affirmation. Though Lucille is from Jamaica, she can indeed vote in London. The British National Act of 1948 established the status of Citizen of the U.K. and Colonies (like the islands of the West Indies). In a later scene, Lucille admits to Sister Julienne a longing for her home in Mandeville, Jamaica. Maybe she doesn’t feel at home enough in Poplar to think she should vote? To Ms. Millgrove’s horror, the efficient social worker finds the hidden stash of her own human waste, stuffed up the small fireplace, wrapped in pickle-size bundles. This must be the oddest reference to human feces on television, ever. Walking to the outdoor toilet was too much for Ms. Millgrove and she’s humiliated. Ms. Millgrove will go to a nursing home. 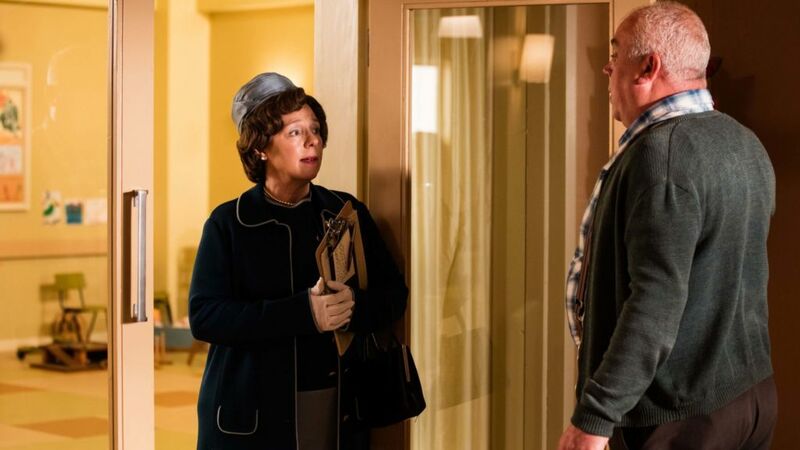 Lucille has a few of Ms. Millgrove’s belongings for safe delivery to her future residence and she sorts through some in the presence of the midwives. She finds an unfamiliar medal with Ms. Millgrove’s name engraved on it and Nurse Crane recognizes what it is. It isn’t for Ms. Millgrove’s work driving an ambulance in World War I, but to recognize her courage in the fight for women’s right to vote, and specifically, her hunger strike. The political hunger strikes of members of the I.R.A. in Ireland, Ghandi, and Guantanamo prisoners are in recent memory, but not those of British suffragettes in the early 20th century. Like many suffragettes, Nurse Crane’s aunt was imprisoned for advocating for women’s suffrage (right to vote) and went on a hunger strike. The forced feedings that resulted were brutal and dangerous, as Nurse Crane and this article from the Museum of London describe. This is one of the reasons why Ms. Millgrove fears being institutionalized. In 1918, women over 30 who met a property qualification won the right to vote in the U.K.; in 1928, the Equal Franchise Act granted women 21 and over equal voting rights to men. Ms. Millgrove won’t go to the nursing home so a court order is issued. A distraught Sister Monica Joan urges Lucille to convince the courageous woman to go on her own accord. Lucille finds Ms. Millgrove barricaded in her home, but she allows Lucille in and asks her to join her fight. There is an ambulance crew and police outside and she’s throwing not only cans at them, but her collection of newspaper-wrapped waste bundles! Ambulance volunteer Fred, Sergeant Woolf and Sister Monica among those witnessing the scene. Lucille reasons with the 90-something-year-old that her very own home is now a prison. It’s then that Ms. Millgrove shares the terrible memories of hunger’s pain, and the abhorrent way forced feedings were conducted. She also alludes to the despised 1913 Prisoners Act, known as the Cat and Mouse Act. Hunger strikers would be released from prison to recover at home, but as soon as they were well and appeared in public, they’d be arrested and sent to prison again. And the starving and force-feeding cycle resumed. Lucille says she had to overcome fear to leave her home in Mandeville. And with that, Lucille hands the hunger strike medal to Ms. Millgrove. We next see Ms. Millgrove in a suit, wearing her medal pinned to her lapel. She walks to the ambulance with dignity, and volunteer Fred acknowledges her medal and work. 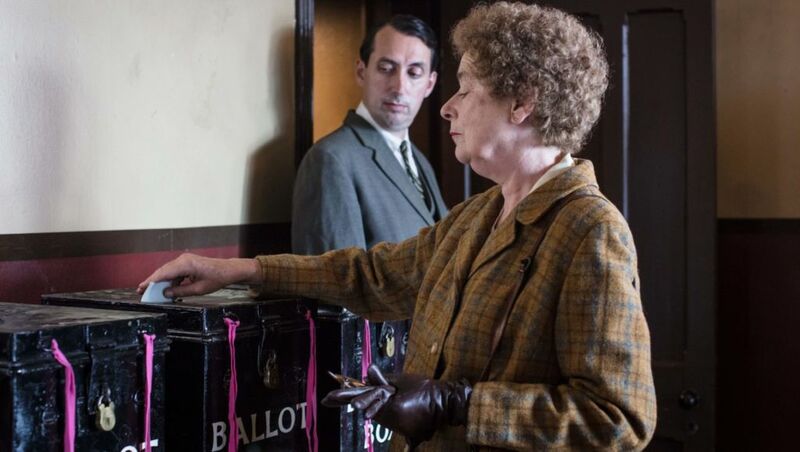 Nurse Phyllis Crane (LINDA BASSETT) casts her vote. Fred is a changed man after meeting Ms. Millgrove (and getting a piece of Sister Monica Joan’s mind). He tells Violet he’s been an idiot and just doesn’t have the guts to be brave like her and run for office. He’s proud of her. Lucille visits Ms. Millgrove in the nursing home only to find she’s passed away in her sleep. She had become very attached to this woman who tried to maintain her independence. In a will, Ms. Millgrove bequeathed the hunger strike medal to Lucille and a poetry book to Sister Monica Joan. And to the neighborhood girl who fetched groceries for her: a copy of The Illiad, lined with 10-pound notes. The Nonnatus House residents leave together to go vote, and a remark from Trixie suggests no one thinks either Fred or Lucille plan to vote. The narrator’s words of wisdom and lilting score follow scenes at the polling station and we’re happy to see Fred arrives with his candidate wife, and that Lucille has decided to exercise her right to vote, wearing Ms. Millgrove’s medal on her lapel. Someone pass the tissues already and make sure your voter registration is up to date! For more background on the year the midwives and sisters are living through, see our 1964 highlights of songs, films, advances in medicine and science and more. 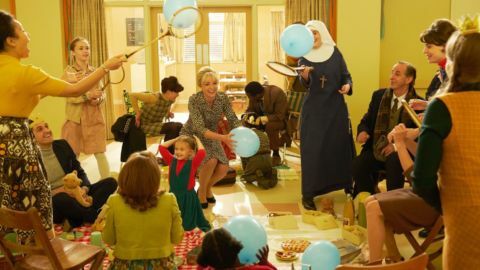 Watch the next six Call the Midwife episodes on Sundays at 8pm. Episodes will stream for two weeks after broadcast. On the theme of women’s right to vote, you can learn more about the work of American suffragettes Elizabeth Cady Stanton and Susan B. Anthony in this Ken Burns documentary.